Experience Mombo Camp, a flagship luxury lodge widely recognised as the finest Botswana Safari in Africa. Mombo has also become the epicentre of a continentally-important rhino relocation and conservation programme. Enjoy 9 spacious tents with unobstructed views over a floodplain teeming with wildlife. 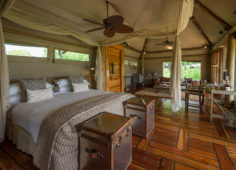 Each guest tent boasts polished wooden floors, an outdoor shower and thatched sala for full connection to the wonders of the Okavango. Visit 4Cs Centre, an interactive experience where you can learn about Wilderness Safaris’ sustainable operations. Mombo Camp, on Mombo Island just off the northern tip of Chief’s Island, is built under large shady trees and overlooks a wonderful floodplain teeming with wildlife. Accommodation comprises eight spacious tents raised off the ground, all built to maximise the vistas over the plains. Each tent is elegantly furnished, complete with en-suite bathroom, a dressing area, indoor and outdoor showers and a bathtub that creates a sense of indulgence. The expanded deck includes a sala and plunge pool. A large living and dining area looks out over that same view, while Mombo’s famous traditional dinners are hosted in the nearby boma. Mombo shares a boutique, spa, gym and lap pool with Little Mombo. Large concentrations of plains game often occur in front of camp; you may see a variety of animals without even leaving the veranda. INSIDER'S TIP: Arguably the best big game viewing in all of Africa with bountiful hunting ground for large prides of lion and leopard. Place: Located just off the northern tip of Chief’s Island, the largest landmass in the Okavango, Mombo is considered the most fertile area in the Delta, with its mix of habitats attracting large herds followed by numbers and varieties of predators. Accommodation: Our recently-rebuilt flagship camp maintains the integrity of its pristine environment through the use of natural materials, minimal human footprint and 100% solar status. Elevated on wooden decks beneath towering shade trees, Mombo overlooks a floodplain teeming with game. Elegant, expansive guest tents celebrate Mombo traditions while a large deck and plunge pool are ideal vantage points from which to observe the passing wildlife. Purpose: Since 2001, Mombo has been the centre of a unique partnership between Wilderness Safaris and the Botswana Government in a pioneering rhino conservation programme that has seen healthy breeding populations of both Critically Endangered black rhino and Near Threatened white rhino reintroduced to and living in the Okavango Delta. 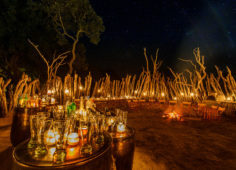 Mombo Camp is a flagship luxury lodge, widely recognised as the finest Botswana Safari in Africa. 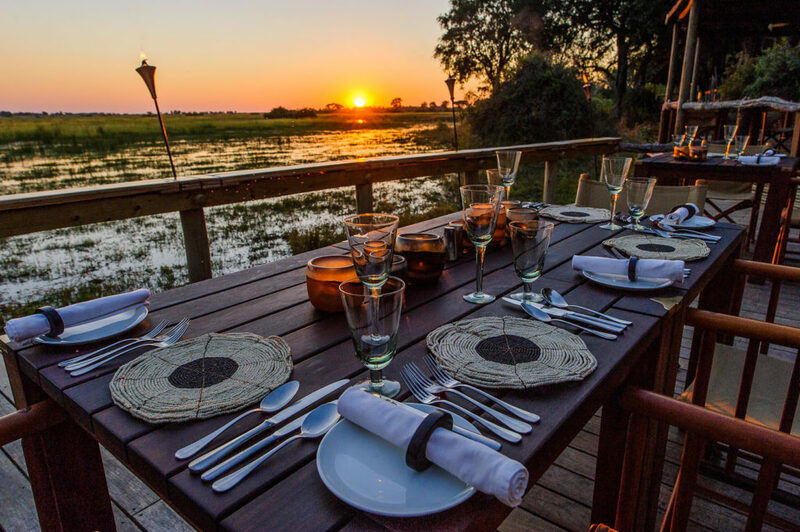 Located in the heart of the Okavango Delt, Mombo is the most famous Botswana accommodation. Mombo is situated in the Mombo Concession and is on the North Eastern tip of Chiefs Island inside the Moremi Game Reserve, the centre of the Okavango Delta. Often talked about as the predator capital of Africa, the Mombo Concession hosts astonishing concentrations of Africa's famous 'Big Five' (Rhino, Elephant, Buffalo, Lion, Leopard). 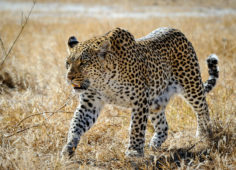 Game viewing here is well regarded as some of the finest in Africa, with the leopard and lion viewing especially is nothing short of exceptional. Mombo Camp is home to two famous groups of predators: the star of the legendary film, ‘Eye of the Leopard’, Legadema and her daughter Pula, and the Moporota pride of lions. 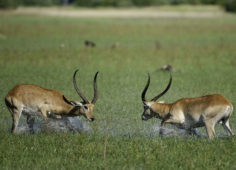 Together they offer thrilling game drives as guests seek them out. The main area of Mombo Camp is very large, with beautifully furnished lounge areas, a library, well-stocked bar that is open throughout the day and where pre-dinner drinks are served. The deck in front of this main area joins a firepit and the al fresco dining area. Mombo Camp’s nine large and luxurious tented chalets are raised high off the ground. Tents are timber-framed with canvas walls, and furnished with a very large, very comfortable bed. Each tent also has its own lounge, minibar/fridge, plus a tea and coffee station and a writing desk. Another section of the tent houses an open-plan bathroom, which boasts his and hers showers and basins. The toilet is in a separate cubicle and a door leads out to an open-air shower. Birding, Nature, Wildlife, And more. This 12-day bush-beach vacation is designed for adventure and relaxation. Explore two very different worlds as you seek out wildlife in the mind-blowing Okavango Delta where solitude in nature is key. Then completely change your environment as you fly to the Seychelles for a week in luxury – warm oceans and sunny beaches! The unique combo of Big 5, bush walks, mountain bike rides in island forests and deep sea diving make this simply the best holiday ever.